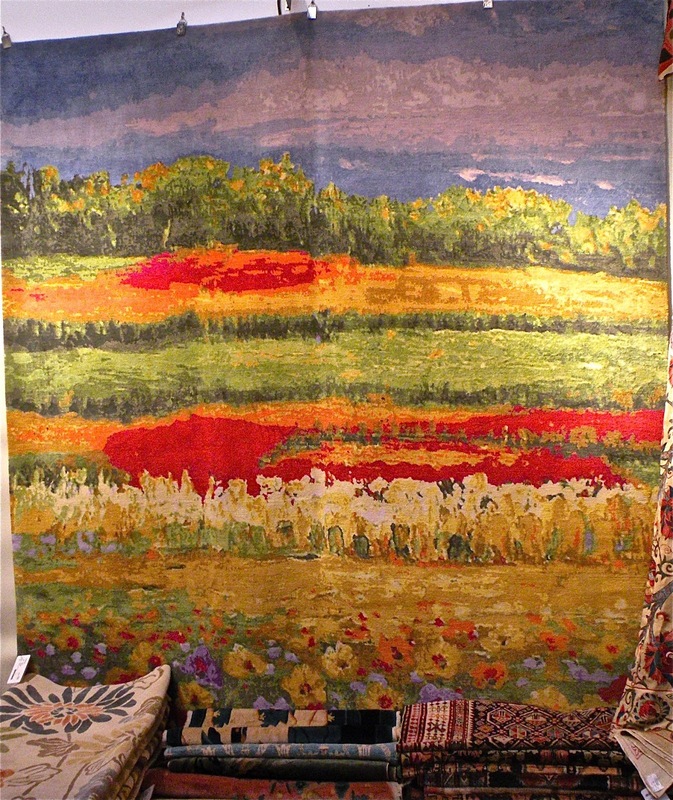 Last month, I attended the AD20/21 (Art & Design of the 20th and 21st centuries) show in Boston and nearly fell off my high heels when I came upon these amazing new rugs from Landry and Arcari. 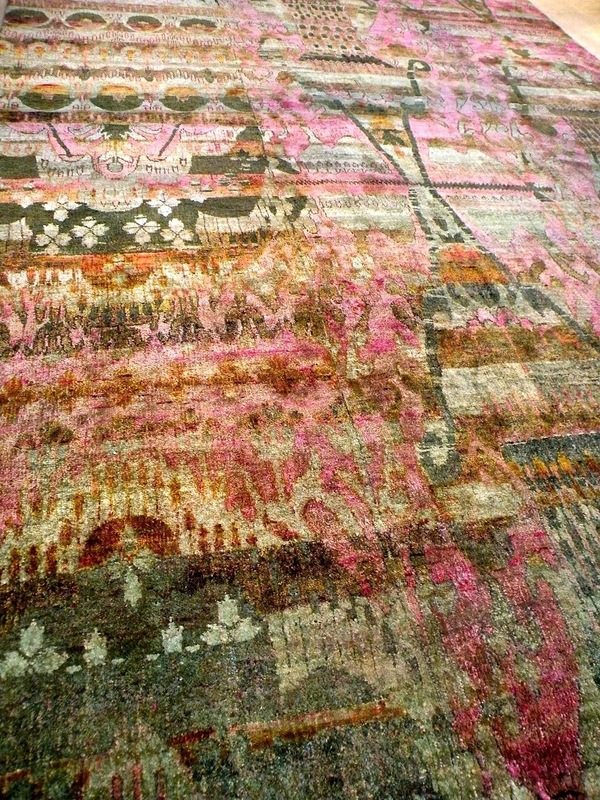 L&A is widely known for their beautiful collection of oriental carpets hand selected and commissioned from sources all over the Middle East and India. There is no question that this new collection of rugs belonged in an art show and are certainly beautiful enough to hang on a wall as the focal point of a space – although they are made to be walked on! There is a touch of Monet at Giverny, only ramped up a few notches in these pieces. close. 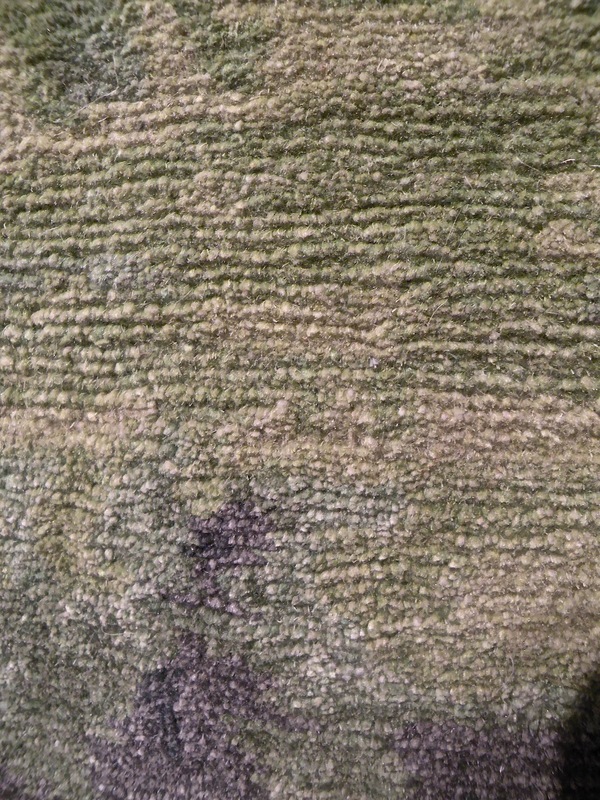 The detail below is an macro shot of the middle right edge of the carpet above. The many shades of green wool combine to create a visual texture. They also employ different weight wools and knotting techniques for added textural interest. The colors in the rug below are were just amazing. Unfortunately, I’ve misplaced my notes from my chat with owner Jerry Arcari so have no details and these rugs aren’t yet on their website, but I’m sure information will be there soon enough. silk surface. A riot of color and feast for the eyes! I literally tripped and nearly fell as I basically ran towards this gorgeous pillow below. It’s pretty big – maybe 36″ wide – the photo doesn’t do it justice. 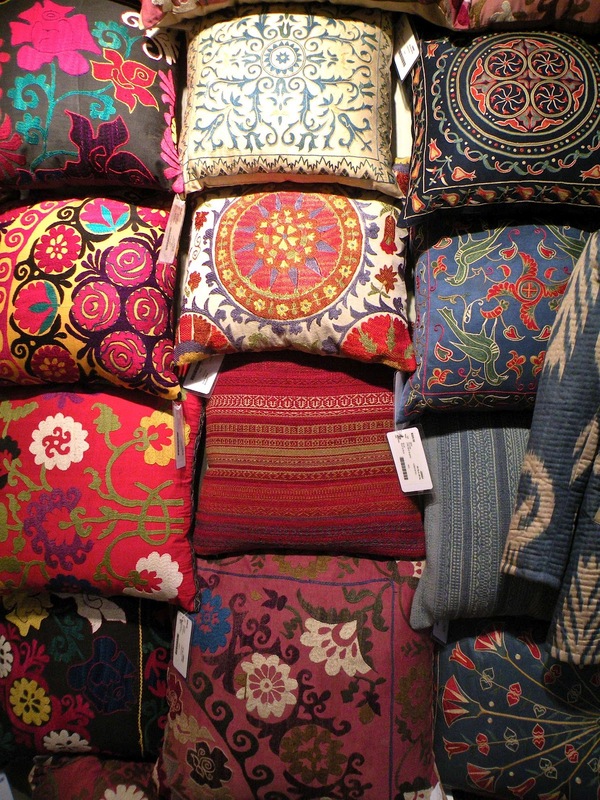 And, the prices on all the pillows are very reasonable for the quality. I‘m busily putting the final touches on the two seminars I’ll be presenting next week at IWCE’s Vision12 Conference in Chicago – which is why there have been a dearth of postings this week. My in box and brain are chock full of post ideas, just not time to get them out!! I’ll be speaking on Social Media and also Team Building Across Design Disciplines. Both talks are on Tuesday the 24th. Concurrent to Visions is KBIS (Kitchen & Bath Industry Show) which I’ll be attending on Wednesday. On Thursday I’ll be hitting the town and seeing a little of the Windy City before I head back to Boston on Thursday evening. It’s a pretty whirlwind trip. You can follow me on Twitter @surroundings if you want to check in.